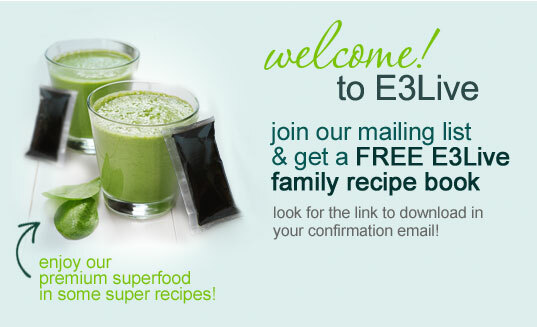 E3 Kelp Soap - Super fatted with almond oil, our E3 Kelp Soap also contains saponified oils of olive, coconut, and palm, ground kelp, chlorophyll, and E3AFA. Essential oils of juniper, frankincense, elemi, laurel berry, patchouli, geranium, and oregano give this soap deep cleansing properties and extra soothing benefits. A seaweed found on rocky shores of all of the world's oceans, Kelp contains a variety of minerals, amino acids and other essential nutrients. Its therapeutic properties are often touted due to it being a rich source of iodine and iron. It is a true miracle plant! Saponified oils of Olive, Coconut, Palm, and Almond. Water, ground kelp, chlorophyll, and E3AFA (Aphanizominon flos-aquae). Essential oils of Juniper, Frankincense, Elemi, Laurel berry, Patchouli, Geranium, and Oregano. I reallty enjoy using this soap because it does not dry my skin. These are the most wonderful soaps I have ever used! They lather so well & I feel so clean & refreshed after using it. My favorite is the kelp & it will be a staple in my home from now on. 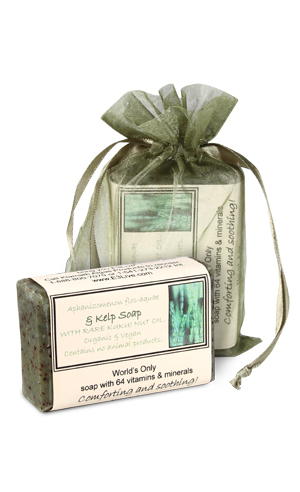 Once you try this kelp soap you will not bother with any other brands. It lathers up on my puff and cleans my skin. My shower time is so relaxing now. Everyone in my family loves this soap. Great product. The trial size is used very quickly, of course, with no noticeable changes. Really like this soap. Left my skin feeling moist not dry. Will purchase again. This soap was great. I first tried it as a sample in the starter pack, but i liked it so much that I ordered it again. Leaves skin feeling very soft without any residue. I tried a sample of all of the soaps. I liked them all. another good bar soap that's not too drying, and leaves the skin happy. Love how healthy and fresh this soap feels. Leaves a fabulous finish on your skin, not too slimey, and not drying at all. Trick: use a sponge or loofah.